You are here: Home / Recipes / The Best New Year’s Eve Appetizers! 20 Of The Best New Year’s Eve Appetizers! With December 31st just around the corner, it’s time to start planning your New Year’s Eve! The best New Year’s Eve appetizers are easy to make, taste amazing and take little to no effort to get onto your table! Party all night long with insanely delicious food! From dips to stuffed things to round things and spicy things, plus wrapped things, there’s something here for everyone! Not only are these stuffed mushroom SUPER delicious, this simple recipe makes mushrooms taste so good! 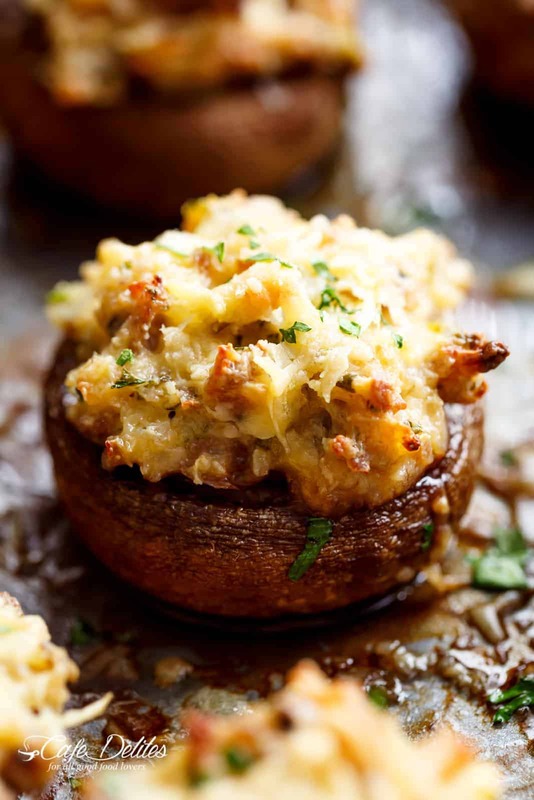 Even non-mushroom lovers LOVE these Sausage Cream Cheese Dip Stuffed Mushrooms! 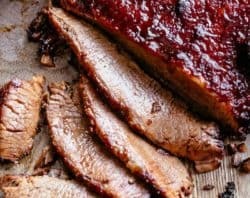 Juicy and meaty on the outside, while creamy and full of flavour on the inside, WITH LOW CARB options! 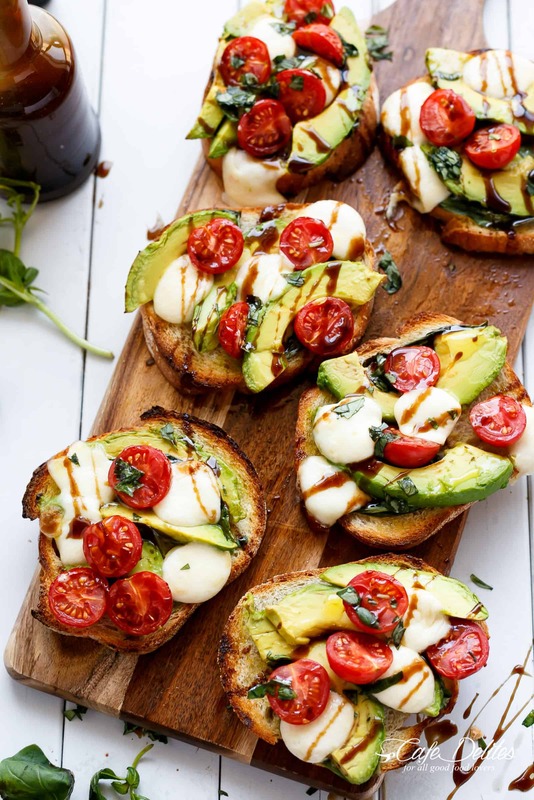 Golden crisp little toasts with olive oil and garlic are piled high with Caprese flavours and ingredients, then drizzled with balsamic glaze for an extra flavour explosion in your mouth! These Avocado Caprese Crostini have been SO popular since I first posted them a couple years ago! 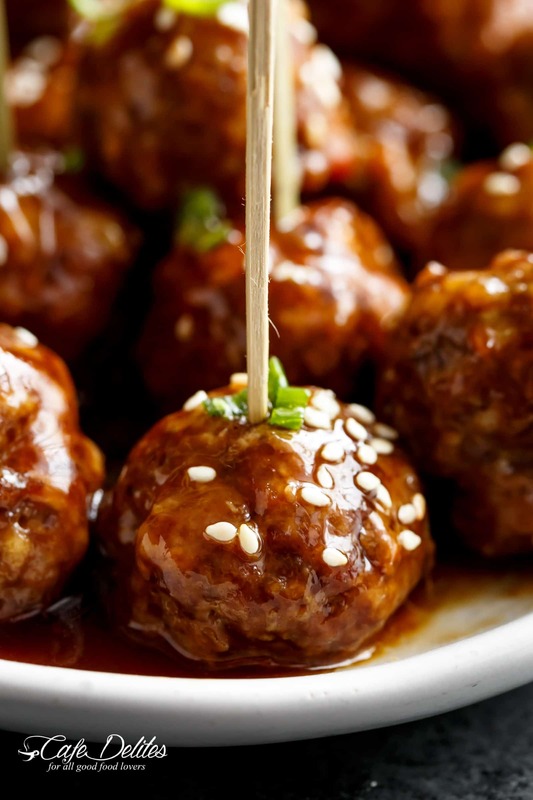 Smothered in a thick and easy to make homemade teriyaki sauce, these meatballs are so versatile! The BEST part? 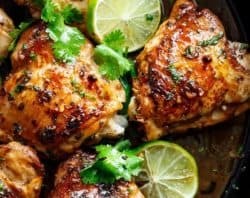 Get your oven to do the work for you! This is a showstopper! 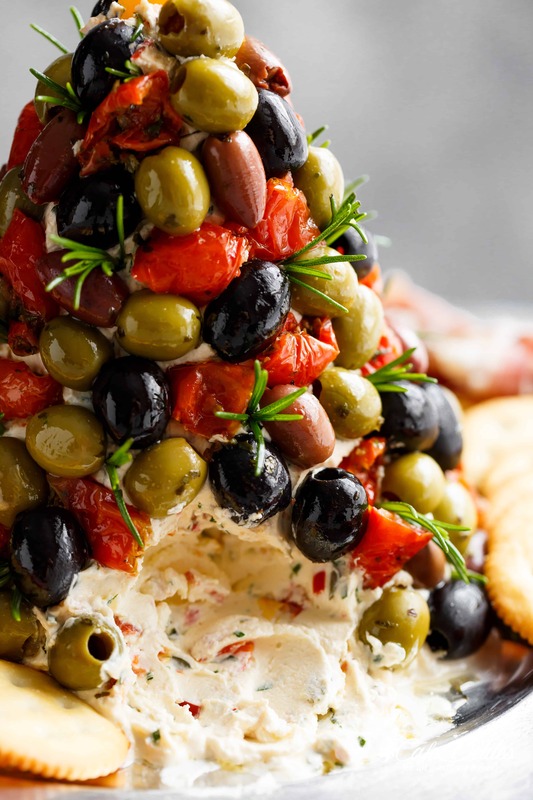 Move over antipasto platters…this tree is even better and PERFECT for New Year’s parties! Not only is this cheese ball full of sun dried tomatoes, red bell peppers, chives and seasonings on the inside, the OUTSIDE is where it gets antipasto serious! Serve it on a platter with cold meats such as salami and prosciutto, PLUS crackers! 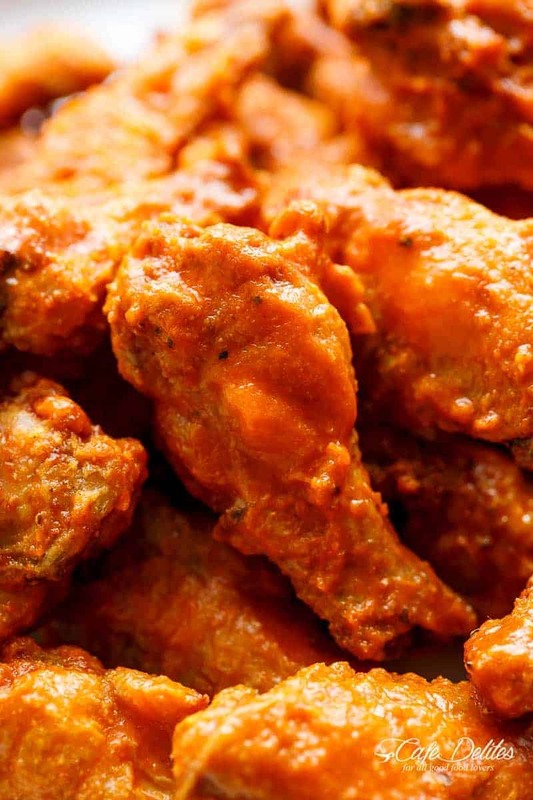 Crispy Buffalo Chicken Wings are baked — not fried — using one ingredient to fool any deep fried buffalo wing fan! 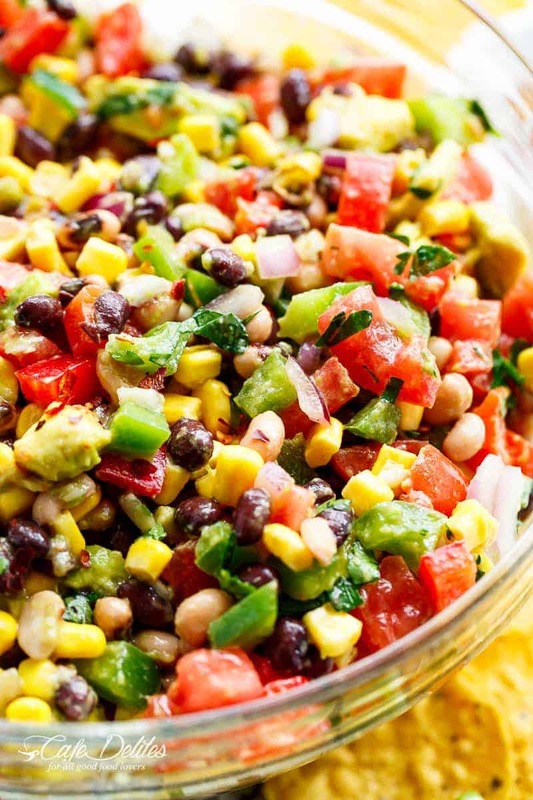 The best salad or appetiser for any occasion! Dip your chips in and get ready for a flavour explosion! 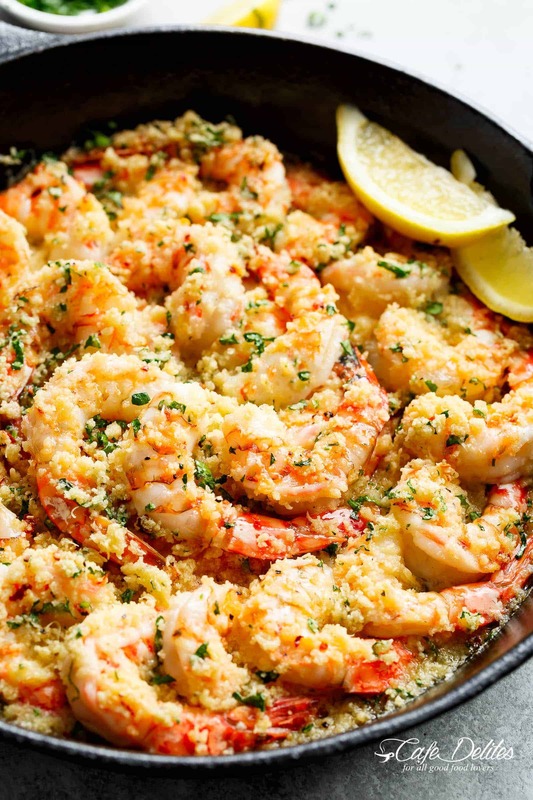 Oven baked shrimp topped with flavourful golden and buttery, garlic parmesan breadcrumbs. This Crispy Baked Shrimp Scampi is easy to make with a fancy restaurant flair right at home, and takes only minutes to prepare! 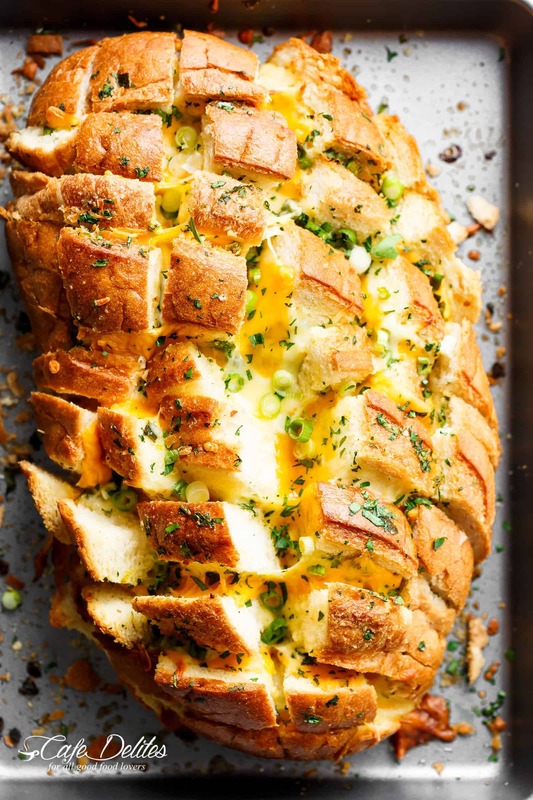 If you’re looking for an easy appetiser for entertaining your family or friends, look no further than this a Bloomin’ Onion Garlic Bread (or Pull Apart Bread)! Ultra cheesy with two types of cheese baked between wedges of fresh bread. Even with Christmas behind us, people STILL love this festive and healthy Caprese Wreath! 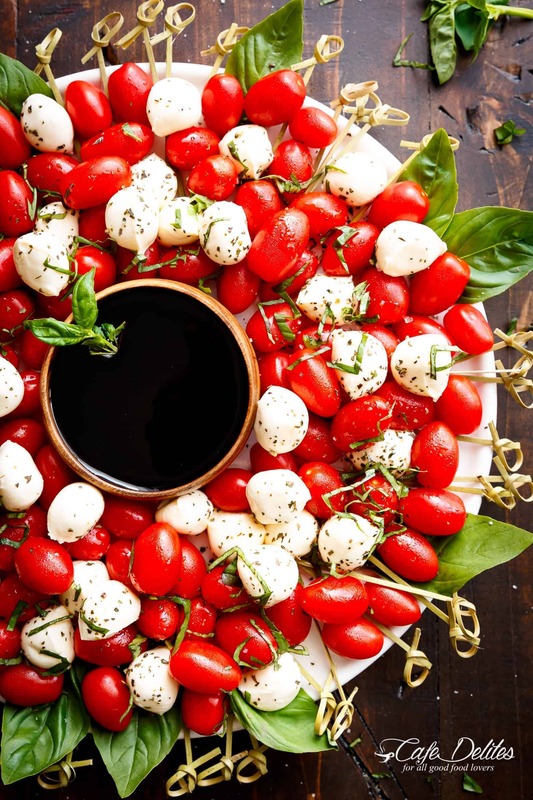 With a beautiful and thick balsamic reduction in the middle of your platter, this Caprese Christmas Wreath is the perfect starter! 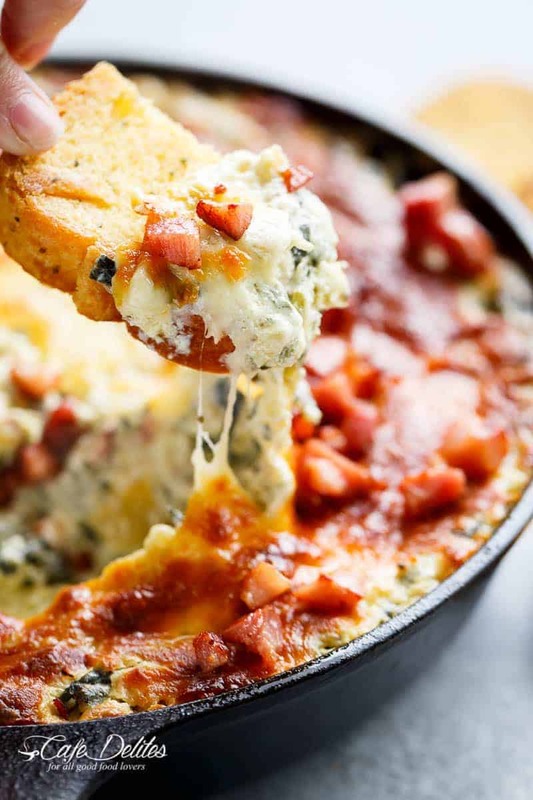 Warm Spinach Bacon Artichoke Dip is a hit around the table! Made with minimal ingredients and topped with crispy bacon, what’s not to love! 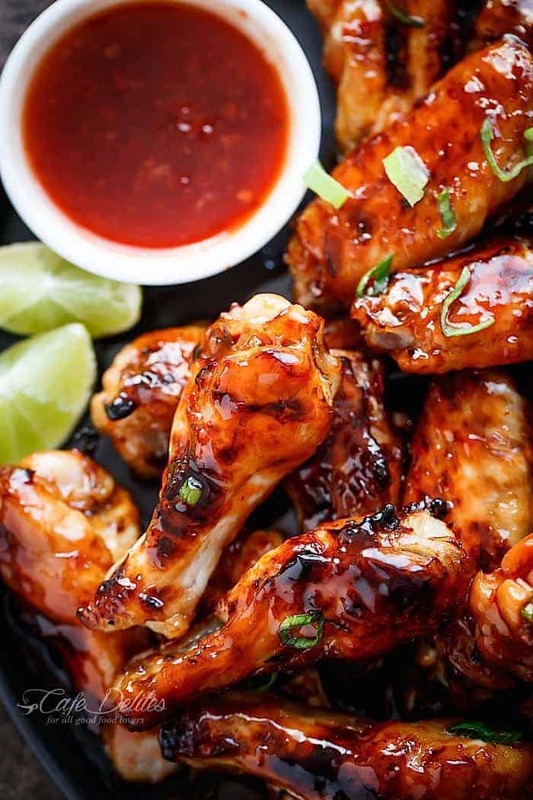 Glazed with a sticky sauce infused with authentic Thai flavours you most probably already have on hand in the kitchen, the sticky dipping sauce also doubles as your marinade! 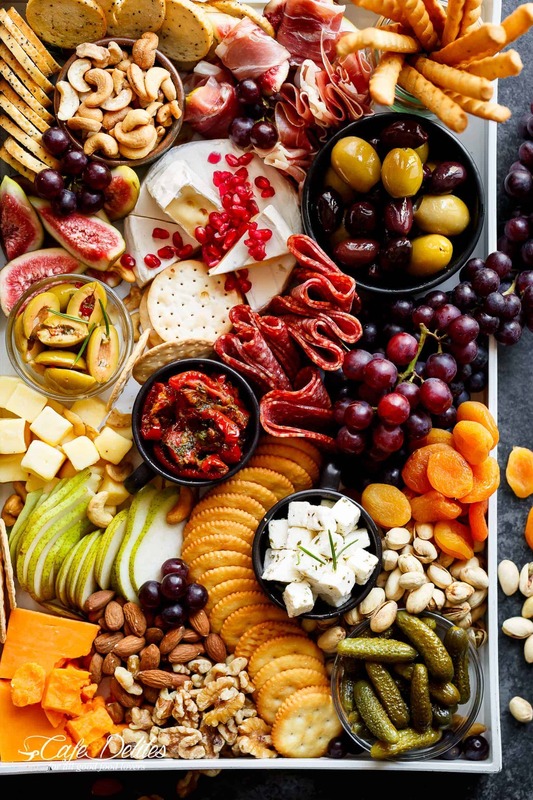 A quick and easy throw together cheeseboard loaded with EVERYTHING to suit EVERYONE! 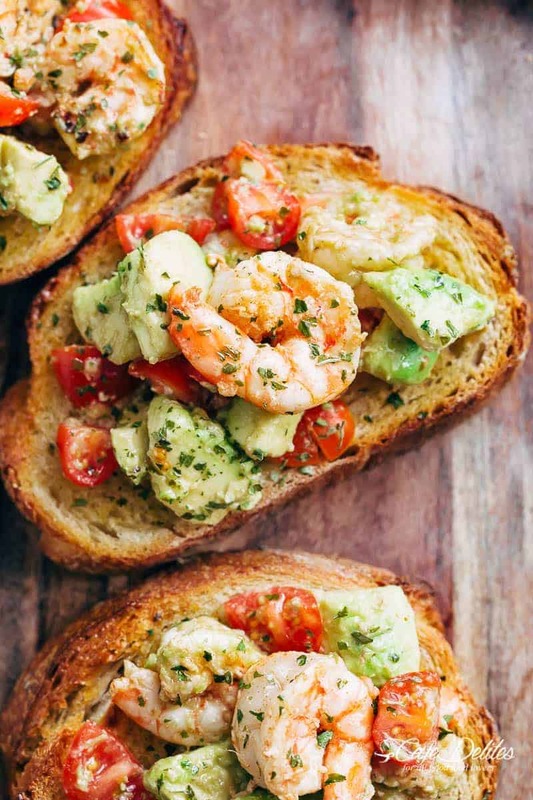 Crunchy garlic bread meets a simple and easy to make shrimp and avocado topping, mixed with grape or cherry tomatoes and beautiful flavours! 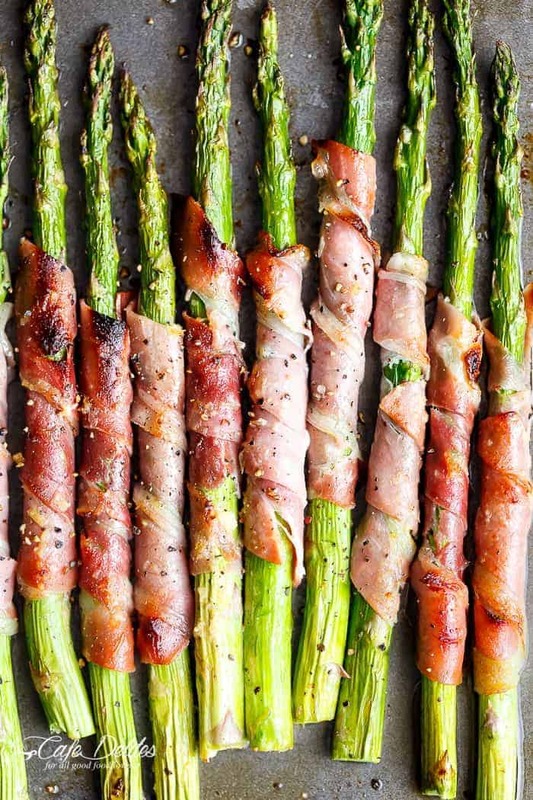 Wrapped asparagus is simple and quick to make. The ultimate finger food, side dish or appetiser, this is hands down the BEST low carb appetizer! One hell of a way to start a party, whether your partying with people — or having your very own snack party. Combining two favourites into one! 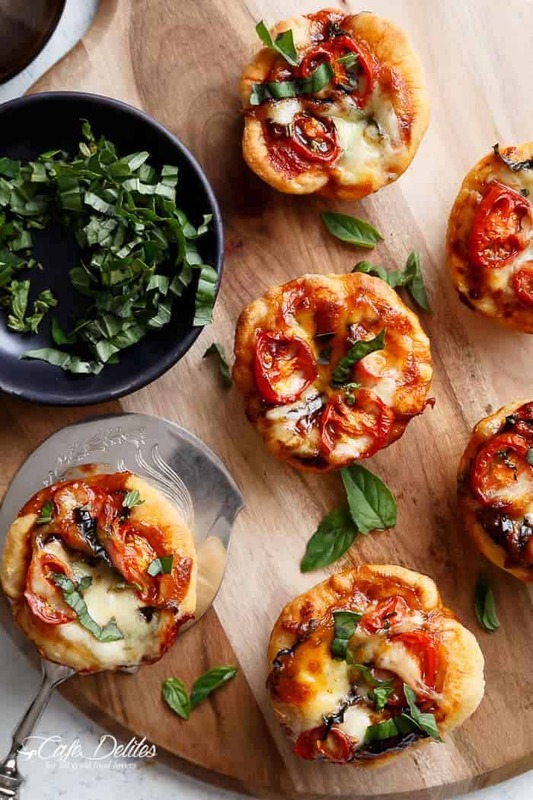 Caprese salad meets pizza in these delicious deep dish pizzas made easy in a humble standard muffin pan with store bought pizza dough! 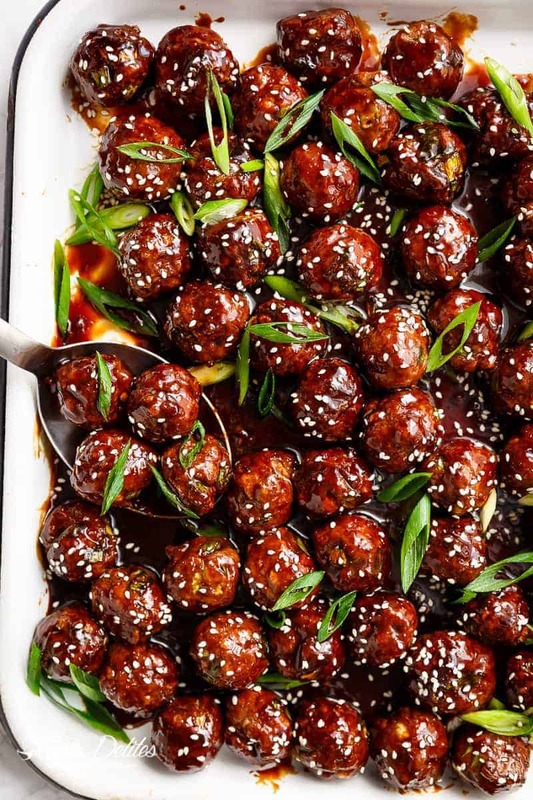 Tender mongolian meatballs are not only filled with asian flavour — they are smothered in the best homemade mongolian sauce to wow your guests! 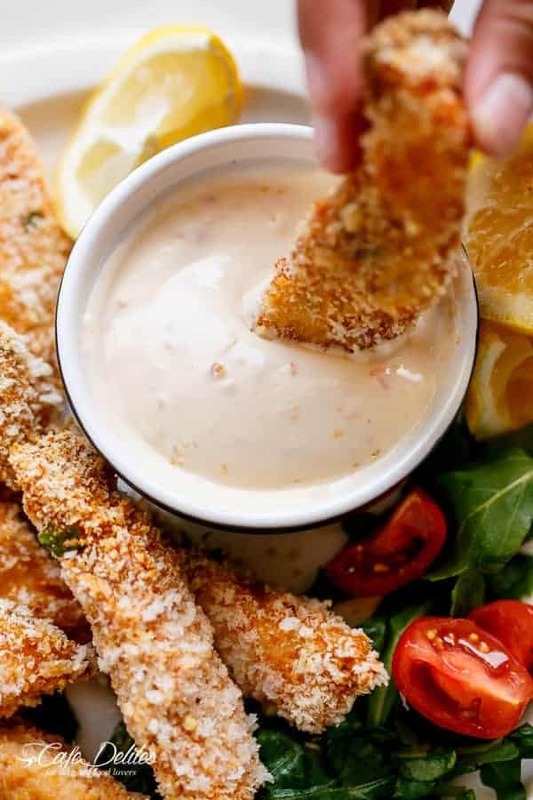 Tender garlic flavoured chicken strips are breaded in Panko for added crunch, baked until golden and crispy with less fat than deep fried! 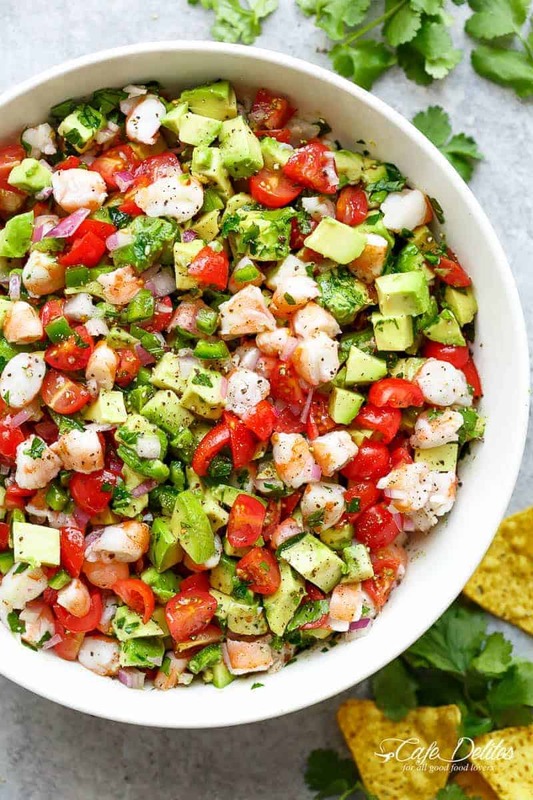 Serve with a sweet chili mayo! Have you ever just wanted the best of both worlds and ended up cramming them into one? That’s what this mash up is. 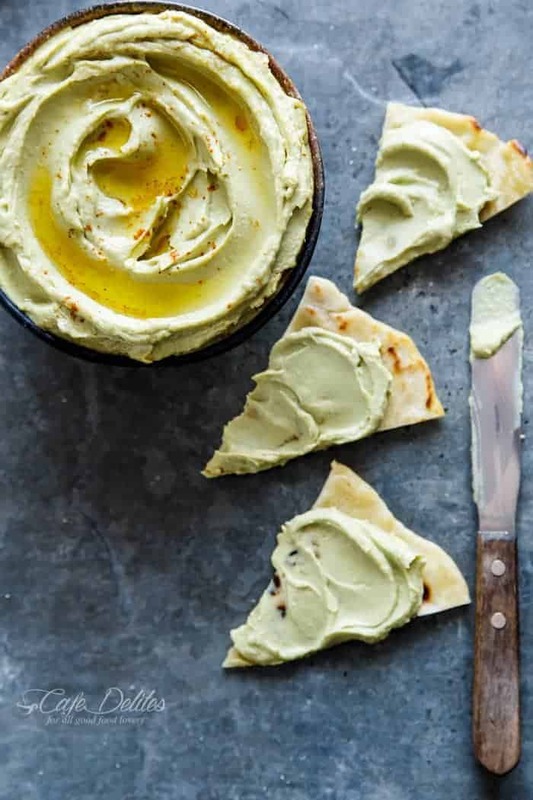 A deliciously creamy blend of avocado dip and hummus makes for one hell of an avocado hummus in minutes! 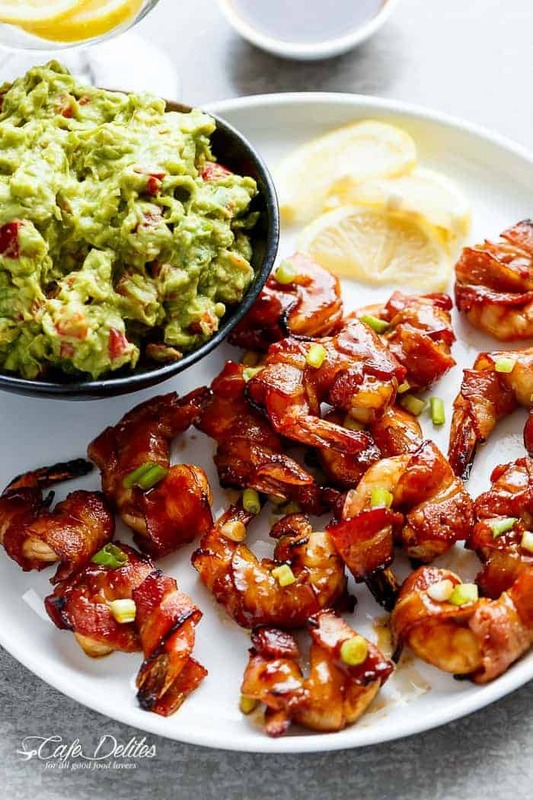 Bacon Wrapped Honey Garlic Shrimp with Guacamole! The perfect light appetiser before any festivities… crispy bacon wrapped barbecue honey garlic shrimp to kick start your holiday! Kick Off 2018 With The Best New Year’s Eve Appetizers! 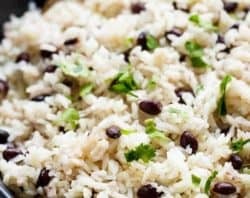 The subtle techniques I’ve been picking up are so translatable into my family recipes, elevating them! 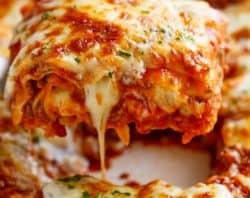 I’ve been following you for a year, cooking recipes here and there, but these past 2 weeks have been 100% your recipes and all the tummies that have visited our home and have been very happy! 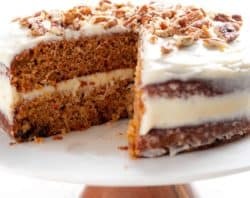 Karina, I absolutely adore your blog and recipes. I’ve had the pleasure of making the garlic butter turkey, and it was a hit with my family. 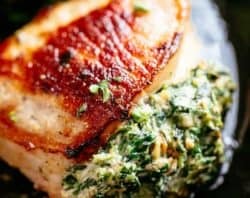 Also, the herb garlic butter baked chicken is another favorite. I’m interested in a nice lentil soup recipe. Karina, you’re amazing! God bless you and your family and Happy New Year! Thanks Karina, I plan to make it today. I’m sure it’ll be great! 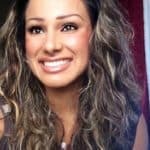 Karina–I am new to your site but so impressed with your recipes. I’m planning to make 1-2 of these for New Year’s Eve–the photography is stunning. Thanks!